I want like ten more of this dress! It was so comfortable to wear around town today. I wore it with flip-flops and ran several errands. But you could also dress it up. I think it will travel well too! I have been trying to dress up my everyday look. I would like to wear more dresses and skirts instead of just shorts and a tee... this dress works perfectly in my plan. Pattern Description: Misses' dress in three lengths or tunic. I did view A but in the below the knee length. Pattern Sizing: This one is available in sizes 4-20. I made a 16- one size smaller than my measurements recommend. Did it look like the photo/drawing on the pattern envelope once you were done sewing with it? Yes, except for the shorter length. Were the instructions easy to follow? Yes, very easy. What did you particularly like or dislike about the pattern? 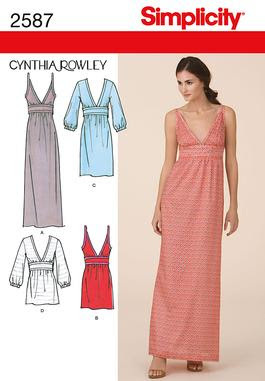 I love the maxi dress trend, but I think an ankle length dress might be a bit too long on a shorter figure. I really like the binding around the bodice and arm edges. I like how it cinches in at the waist to give a more flattering look. Fabric Used: I believe this is a polyester rayon from Joann Fabrics. It cost me $10 for fabric. The fabric is from their Riviera collection. I've been really impressed by Joann Fabrics special apparel collections- they seem to be of higher quality than in the past. You can also get fabrics that coordinate with each other. -I did one size smaller than the patter recommends based on my measurements. - The instructions would have you interface all of the binding, including the binding around the neckline, arm straps, and the bands on the midriff section. I thought this would be not only bulky, but would also defeat the flexibility of the bias cut binding. I only interfaced the actual midriff section but not the bindings or bands on the midriff. I was pleased with the outcome. - As mentioned before, I used the shorter hemline- I believe it was the hemline for view C.
- I inserted an invisible zipper- I actually use an invisible zipper on all my garments except for a fly zipper of course. I love how clean an invisible zipper looks. Would you sew it again? Would you recommend it to others? I would sew several more of these! It was quick and easy to make. It is flattering. It is so comfortable to wear in the warm weather. Yes- I would recommend it to others. Conclusion: Such a cute dress! Can't wait to make some more- maybe in a cotton print next time. Your dress is so cute! Glad you pointed that cleavage thing out, I didn't realize it was cut so low. So, you were able to wear this without the bra showing in the back too? Great review Byrdie, thanx btw. Great dress! I noticed how low the neckline was and didn't buy the pattern, but I love the way you slip stitched... I should reconsider. I saw that fabric this weekend when I was at Joann. It was very difficult resisting any fabric purchases. Hehe.. I gotta get through some of my stash first. But you're right about their fabric collections... I like them a lot more lately. This pattern has been sitting in my stash. I have been hesitating because the neckline looked so low. I think you have a good solution though! a very cute dress indeed. the trick u do with ur very low neckline is very useful to me in the future. love ur fabric. the dress looks perfectly fit on u. fabulous! super cute and very flattering on you! Your dress turned out very nice. Love that print. I am very late to commenting, as I found this on a google search. I am making the same dresses today...LOVE yours! !